A&E BRIEFS La Selva II by Nancy Hall. Contributed photo HALL TO HOST OPEN HOUSE AT NEW ART/CLOTHING STUDIO Artist Nancy Hall will host an open house at Hall is primarily a self-taught artist, the reher new art and clothing studio in downtown lease notes. Inspired by the work of Georgia Sarasota from 5 to 9 p.m. on Friday, May 24. O'Keefe, she embarked upon her own artistic journey, studying design, architecture and art She recently relocated to Sarasota's Histor- education at the University of Cincinnati and ic Downtown Village at 1899 Fruitville Road, the University of Miami in Ohio before she began her career in fashion design and mera news release says. Hall invites visitors to chandising, the release adds. see her new space during the area's monthly "She also designed her own line of stationery, Fourth Friday festivities, the release adds. 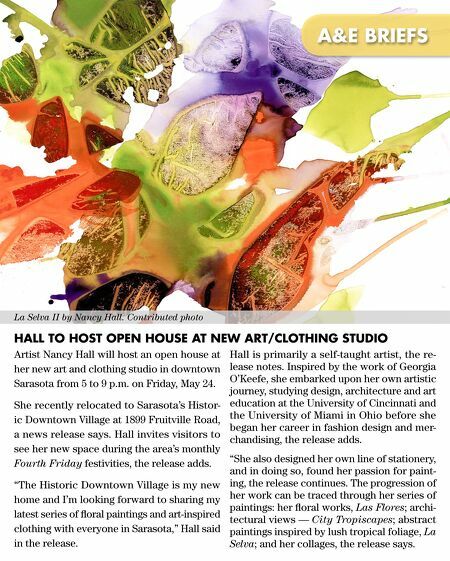 and in doing so, found her passion for paint"The Historic Downtown Village is my new ing, the release continues. The progression of home and I'm looking forward to sharing my her work can be traced through her series of paintings: her floral works, Las Flores; archilatest series of floral paintings and art-inspired tectural views — City Tropiscapes; abstract clothing with everyone in Sarasota," Hall said paintings inspired by lush tropical foliage, La in the release. Selva; and her collages, the release says.